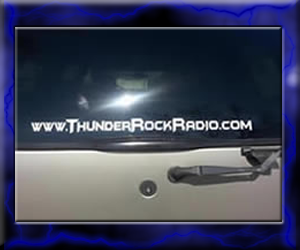 HAVE YOU ALWAYS WANTED TO OWN YOUR VERY OWN THUNDERROCKRADIO® CAR STICKER? With each PayPal donation of $25.00, fans and listeners of ThunderRockRadio® can own and proudly display one of our custom stickers for FREE courtesy of Stick It Out! All that is required is that you hit that PayPal button found on our homepage, confirm that your PayPal address is the correct one to which the sticker is to be mailed, and we will do the rest!.